48-year-old female, 5'3", and weighing 155 pounds developed laxity and loose skin around her abdomen, flanks, hips, thighs and back after losing 90 pounds through a laparoscopic gastric bypass and diet and exercise modification. In addition she developed decreased breast volume, laxity of the breast skin and breast asymmetry. 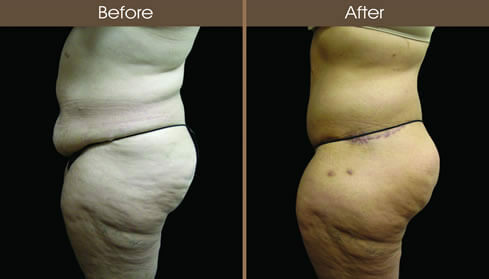 She underwent a lower body lift with flank and back liposuction. She subsequently underwent a combination lollipop breast lift, breast augmentation using 275 cc smooth, round, silicone gel breast implants. Her breast size increased from a 36C to a 36D.